That photo right there freaks me out a little. I mean, it looks just a bit over the top with the cheesiness, don't you think? I debated about even using the photo (I have a couple more demure pics below), but decided in the end to go with the more dramatic approach seeing as how this is titled a "simple" baked macaroni. I didn't want you to think that just because we're calling it simple, it's not remarkably delicious. Cuz it is. I think the reason it's been referred to as simple has to do with it's origins and the very basic ingredients required to put it together. But it's also called Macaroni and Beef (Michael Ruhlman) and Johnny Marzetti (after its namesake, Marzetti's restaurant). I couldn't call it Macaroni and Beef cuz I used ground turkey, and Macaroni and Turkey sounded more odd than compelling. I came across the recipe from Michael Ruhlman, the author and once New York Times food critic. He posted the recipe on his blog and it caught my eye, not only because it looked so good, but because it also looked so familiar. In his post, Mr. Ruhlman mentioned that any one who ate in a school cafeteria in the 50's, 60's or '70's had probably dined on some version of macaroni and beef. Lots of Moms were making it back in the '50's too. In actuality, it was first made in Marzetti's Italian restaurant in Ohio in 1896, so it really has been around awhile. 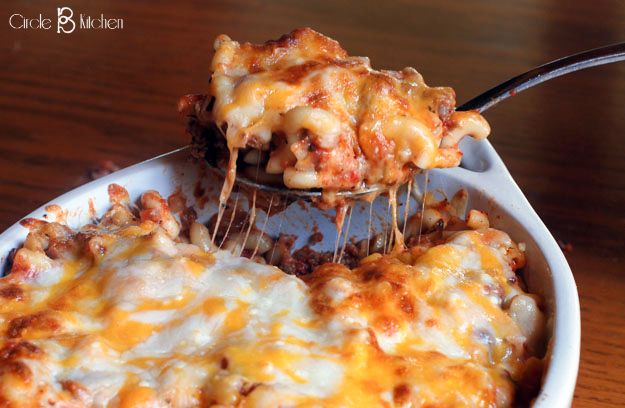 And what we're talking about is simply a casserole of ground meat and macaroni in a seasoned tomato sauce, baked, then topped with cheese and broiled until perfect. What we have here is just a pan of down-home, simple comfort food goodness and a pretty simple meal to throw together for a family on a weeknight. It makes enough for your entire neighborhood, so unless you’re planning on feeding a very large group, I would cut the recipe in half, which would nicely feed 4-6. I made the full recipe, divided it into two pans and froze one for later (without cheese). Also, don’t be tempted to mix some cheese in with the meat, sauce and macaroni; it totally changes the flavors and textures and just isn’t as good. 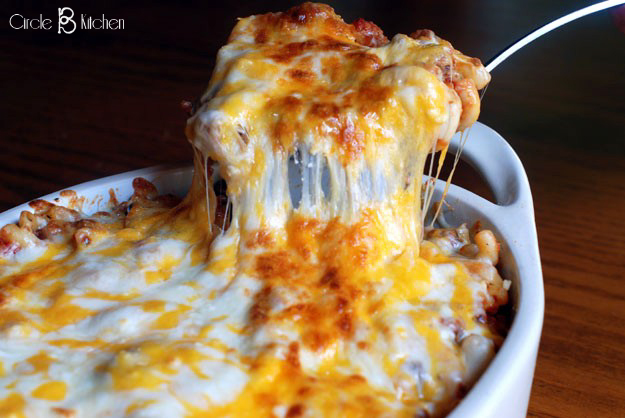 The cheese-y layer on top is where it’s at. optional seasonings: black pepper, oregano, cumin, coriander, chopped garlic, hot smoked paprika, chilli powder—whatever you’re in the mood for (Ruhlman: I just used black pepper, garlic and a tablespoon of fish sauce, which gives it depth) (Me: I used Circle B House Seasoning and crushed red pepper). Sweat the onions in the oil with a three-fingered pinch of salt. Add the beef (or turkey) and cook it, breaking it up as you do. 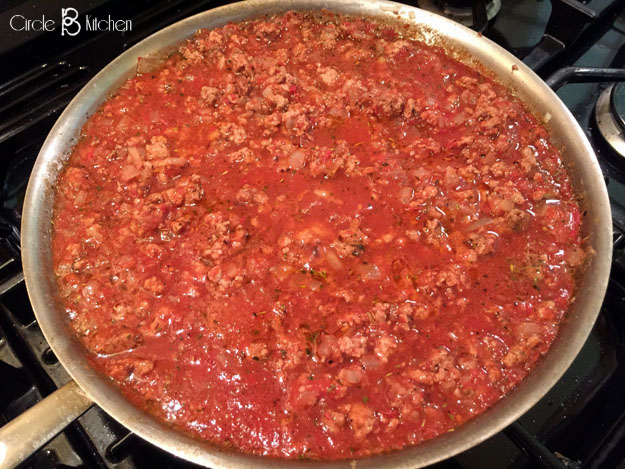 (Ruhlman: Because my beef was very fatty, I cooked it separately and added it to the pot along with the tomatoes. Also an option, but uses an extra pan.) Add another three-fingered pinch of salt or two, along with any dry seasonings you want. Add the tomatoes and any fresh seasonings you may be using, bring to a simmer, then reduce the heat to low and cook for an hour. Cook the macaroni in boiling water till it’s half done. Drain it and add it to the tomatoes. 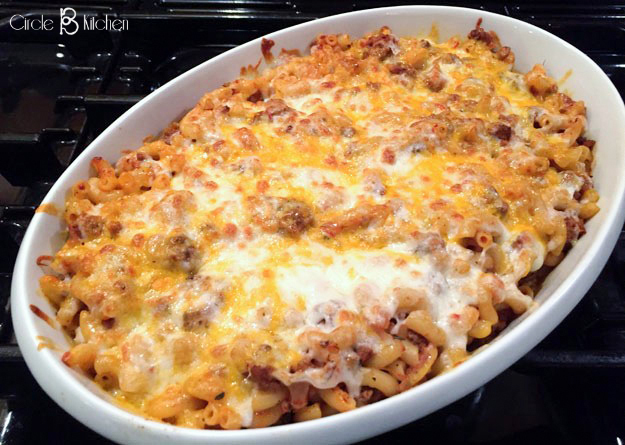 (Ruhlman: I wanted this to stretch into two meals, so I used the whole box, but if you want your dish to be very tomato-y and beefy, you might want to add only half the macaroni). Stir it into the sauce. Taste it. Add more salt and other seasonings as needed, and cover. When it’s cooled and the pasta has absorbed the tomato juices, transfer it to a large baking dish and cover it with foil. It can sit out for several hours like this, be refrigerated for up to two days, or frozen a few weeks. Note from me: When I reheated this, I stirred in a cup of marinara sauce. The pasta will continue to absorb the sauce in the fridge or freezer, so the extra sauce helped to keep it from drying out when baking.